Discover the spectacular scenery of the Llŷn Peninsula coast path which contains some of the very best sections of the new Wales Coast Path and forms the western section of the North Wales Pilgrim Way. 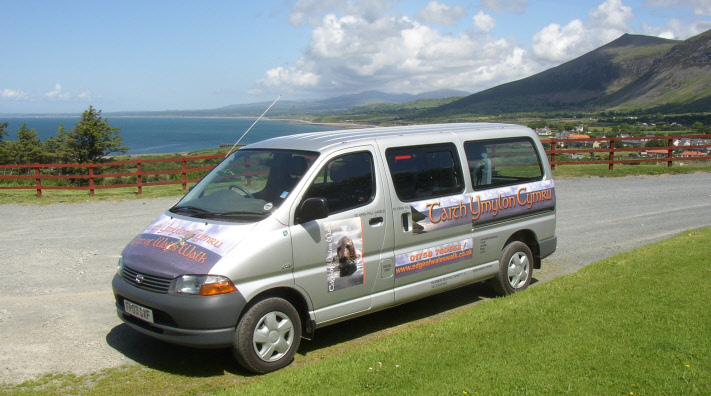 The Edge of Wales Walk team of local people were pioneers in developing this new walking route and have been providing self guided walking holidays with accommodation and luggage transfer using our own minibus, to visitors from all over the world for over 12 years. The route, with many new sections added in 2015, now extends over 95 miles, all the way from Caernarfon to Porthmadog. You can walk it all or choose which sections suit you best. All along this coastal path you will find new signs, bridges and way marks and we will lend you a pre-programmed GPS unit which will guarantee that you will never get lost. You will be following a Celtic Trail that is rich in history, an old Pilgrim Trail that dates back to the pre-Christian era that leads past ancient standing stones, Pilgrim Churches, Holy Wells and then on across the Sound all the way to Bardsey Island. This is a rare and unspoilt coastline where seals, dolphins, sea birds and wild plants abound. Our hiking tours are here presented to you as complete walking holiday packages with maps, accommodation, walking notes and information, luggage transfers using our own minibus and care and attention throughout. We are happy to adapt these packages to suit your individual needs and budget. You can part use your own car or rely entirely on our transport. You can start on any day of the week at any time of year. You can camp, stay in guest houses or hotels or base yourself in a self-catering house. We give help and personal service to ensure that you enjoy the perfect walking holiday that you deserve - extra transport if your walk does not finish at the accommodation and a back up service should anything go wrong. We all live locally so we are never far away and can be flexible if plans change. Because of our 24 hour back up service, the varied topography and the ease of following the route, the Edge of Wales Walk is ideal for walkers tackling a linear walking trail for the first time and for those who want to combine a coastal walking challenge with an enriching cultural experience in the heartland Welsh speaking rural Wales. Our Gallery has photos from our Walking Holidays. We are local and we have our own transport and places to stay. Walk the Whole of the Wales Coast Path! Together with our friends we can offer you luggage transport and accommodation booking all the way around the Wales Coast Path – all 870 miles of it! See our new film below.